So, we are guessing that you already know that inhaling and eating CBD-infused products provides a variety of health benefits, but are you aware that you could be drinking it too? 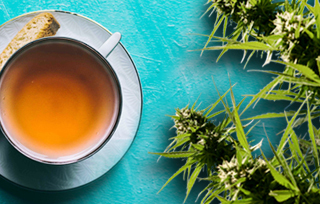 While CBD tea hasn’t exactly been used for hundreds of years, it is becoming increasingly recognized for its health benefits due to the fact that the active component boasts many positive therapeutic properties. Combining CBD with the therapeutic herbs and spices found in tea produces a unique holistic remedy that has the potential to alleviate a variety of symptoms, improve mood, and boost energy. CBD tea is one of the healthiest drinks on the planet. It’s loaded with antioxidants, vitamins, and nutrients. Whether you are desperately searching for a way to induce more relaxation into your life or will be going on a flight soon, and flying makes you anxious, or maybe you are just looking for a way to help you sleep better at night, CBD tea may be the answer you’ve been looking for. CBD tea offers the user a relaxing and easy way to get their daily dose of CBD. Tea is an aromatic, usually hot beverage that has been used for thousands of years in human culture. Derived from the plant species known as Camellia sinensis, tea is an almost unrivaled daily drink that refreshes its drinkers and helps them to unwind. Tea has come a very long way, and the word “tea” is now attributed to a range of herbs and botanical species that could be infused into hot water to make a tasty and even medicinal drink. Tea is notoriously relaxing and for some people may even form a meditative practice. Adding compounds from cannabis into the mix, like CBD, can make the drink even more therapeutic and calming. This is the ultimate reason why tea is such a pleasant and effective way to dose CBD. CBD tea is a simple, yet highly effective drink. There are multiple CBD teas available on the market which may be used to make the brewing process even easier. Often, different brands offer different teas, including hibiscus, green tea, turmeric, yerba mate, and many more. Alternatively, you can get creative and make your own concoction. Cannabinoids, like CBD, don’t absorb well, or at all really into the water, as other molecules added to traditional tea do. However, they do very much have a fondness for fat sources. This is why products like cannabis coconut oil and cannabutter are so popular. They give a fatty base which works to absorb the cannabinoids, and they are also very easy to add to a wide range of foods and drinks. These kinds of butter can be added in tea to make a more calorically dense drink that also has good levels of CBD. Another very easy and quick way to make CBD tea instantly is to add a few drops of high-strength CBD oil to fresh warm water. This method helps you to achieve accurate dosing and speedy application. Pure CBD is effective for some people and is a good option for those who want a speedy dose of the molecule. However, there are plenty of other herbs that can be infused into the brew to enhance the effectiveness and taste of the tea. Those who are just looking for taste might want to add herbs, like mint, sage, or lavender. For those who want to enhance the medicinal contents, medicinal mushrooms, such as reishi and chaga, may be a good idea. 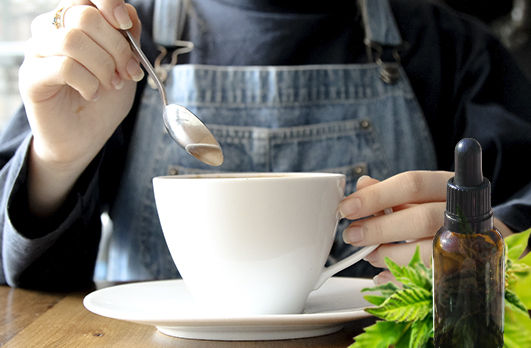 Tea is an easy and enjoyable way to administer CBD, and it’s one of the best options for those who aren’t keen on smoking or vaping the substance. Plenty of users may drink CBD tea simply for enjoyment and relaxation. But others may use it for the therapeutic action that it has against certain symptoms. Inflammation has shown to be present and be a possible causative factor in a variety of different health conditions and diseases. In addition, inflammation is a classic sign of autoimmune diseases, like Crohn’s disease, Multiple Sclerosis, and irritable bowel syndrome. Studies have found that cannabinoids could provide a potent treatment option for these inflammatory disorders. Cannabinoids like CBD achieve this effect by using the CB1 and CB2 receptors found in the endocannabinoid system (ECS). By activating these receptors, the CBD is able to help with the regulation of the immune system and helps to suppress the signaling molecules that are involved in inflammation and are known as cytokines. CBD has shown a lot of promise in the realm of chronic pain. Chronic pain differs from acute pain in that keeps activating pain signals for an extended period of time and can last for years after an injury has occurred. This kind of pain may also be triggered by various health conditions, such as arthritis, back problems, migraines, nerve damage, and infections. CBD can be a great choice for people who are suffering from chronic pain and could even assist those who previously relied on potentially dangerous painkillers, like opioids. CBD has been found to inhibit the body’s absorption of anandamide, which is a compound that is associated with the regulation of pain. CBD increases this effect and can provide relief for conditions like fibromyalgia, and arthritis. CBD tea could also help with the causes of nausea. Nausea can have a variety of causes, from dizziness and upset stomachs to migraines and sickness, nausea is a non-specific symptom. When this condition arises, a small cup of CBD tea could be enough to relieve it. The combination of CBD with stomach-soothing herbs like peppermint can also provide much-needed relief for patients who are undergoing chemotherapy. The simple routine of drinking tea in the morning or even in the evening before bed is a calming practice for many people. When you add high-quality herbs and CBD to the mix, something magical can happen. For example; Hibiscus, Chamomile, Tulsi, and Kava all have unique calming properties. From lowering blood pressure to general relaxation, these herbs are a natural solution to help the body to adapt to stress and help to normalize bodily functions. Even if you don’t suffer from any health conditions, CBD tea is a great way to elevate the mood and relieve stress. Although there are many ways to take CBD, ingesting it in tea form releases the CBD into the system more slowly and won’t irritate the lungs. Also, incorporating CBD into your tea gives the added bonus of drinking a relaxing cup of herbal tea. Packed with vitamins and antioxidants, CBD tea detoxifies the body and provides the body with valuable nutrients that it may be craving. Leia from Ashburn just bough! Londyn from Ashburn just bough!